Discussion in 'Android Devices' started by robo21, Aug 10, 2010. Ugh, I was really hoping to save 55% off the cost of the Tmobile Gel Case but alas it was not to be. When my wife saw the case installed on the phone she said "what the heck!?" That's because the case fits the Vibrant unevenly. And it doesn't wrap around the bezel fully. Bugdog, llblwskydrgn and Mark27 like this. good review... I too have the tmobile case and would also give it a 4.5 out of 5. OH MY GOSH, i wish I read this before I ordered my case. I ordered my Amzer case last week. It is still not here! I purchased off ebay, however the ebay seller is actually some guy who owns Amzer. He sells on ebay also. This is what happend, I agreed to purchase the silicone case according to the picture both on amzers site and on ebay, they were the same picture. AFTER I PLACED MY ORDER, the owner changed the photo of the case, to something that I was NOT ATTRACTED TO, something really ugly. I contacted him, letting him know that I did NOT agree to purchase the photographed product, and that he switched the photo after I agreed to purchase. "I ordered the Amzer green silicone gel case for my Vibrant. I noticed however you recently changed the photo on the ebay listing after I placed my order. The new case photo you updated looks different from the one I had agreed to purchase. Which one are you sending me? "The earlier image was for front not back trust me you will love it when you get it." Can you believe this guy, he deffinately changed the photo of the front also. The first front picture looks nothing like the new front photos he has posted on ebay and his amzer site. Plus JERK it is up to me to decide if I will love it, not you, don't do a bait and switch. I still have not receieved my product! DO NOT BUY FROM AMZER OR Amzers ebay listings if they continue to pull bait and switches. If he infacts sends me my case that I paid for, and the case is good, I will apologize and write a good review. As of now, he pulled a bait and switch on me. Posting one photo, then putting up a new photo after I agreed to purchase of a COMPLETELY DIFFERENT LOOKING CASE! Hey, I don't know if the case is good or bad, I have yet to receive it. My anger is concerning the bait and switch the ebay seller/amzer owner pulled on me in his ebay and amzer.com photos. Once I get the case I will do a review, maybe it is a good case, and better than the original photo he had, either way I don't appreciate a seller switching photos and putting a new photo of a different product up, a product that I did not agree to purchase. Nevertheless, if this different product is infact good, I'll post on here, and give it a good review. Lets just hope it arrives this week. I've never waited over a week for anything from ebay that has a US seller. Thanks robo21, I'm guessing the tmo case is my best bet for a case right now? I was about to put that amzer case into my amazon shopping cart until I read your review. Do you have a review and/or pictures of the tmobile case? Definitely, the Tmobile case is more substantial and protective than the flimsy Amzer case which barely wraps around the face of the phone. 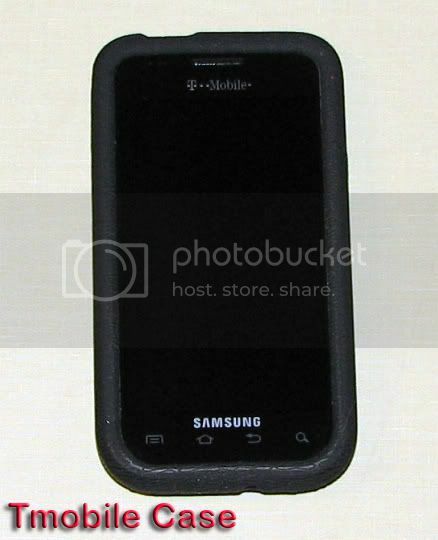 Plus the Amzer looks clunky at the corners whereas the Tmo case is sleeker and more symetrical. The Tmo case is made of noticeably thicker material along the sides but feels sleeker due to the absence of the clunky corners of the Amzer. I've had the Tmobile case for a week, when I saw and felt the fit and the limited protective capabilities of the Amzer I called my wife in, she laughed and said, "What the hell!?" Per your request I shot and uploaded some comparison shots, sorry I was in a hurry so the scale is a bit off from one to the next but you will get the idea. I bought this case to provide my shiny new handset with some grip and protection. I ordered direct from Amzer because Amazon's shipping projection at the time was between 1 and 3 months and I didn't want to wait. Coming out of its packaging the case feels nice enough, but as another reviewer stated, and I can now confirm, the case fits too loosely. I was expecting to have to pull or tug one or more corners of the case to fit my phone in, but the phone just drops right in with no effort needed. This is not a good thing, and it doesn't inspire confidence that the case is securely holding the phone. So, what did Amzer get right? The cutouts for the camera, speaker, micro USB, and a couple of others are perfectly aligned. I have no problem sliding the micro USB cover through the cutout. I like the added thickness of the material around the corners and back too. It's a rugged, almost armored look, that's a stark contrast to the sleekness of the device sans case. Preferences on the aesthetic will widely differ, but I like the look. Let's see... what else? They could have raised the material on the power switch and volume rocker a little more to provide the user with better tactile clues about their positions. Amzer got some of the design right, but all in all this case is too loose, it doesn't fit the phone right, and I don't recommend it. 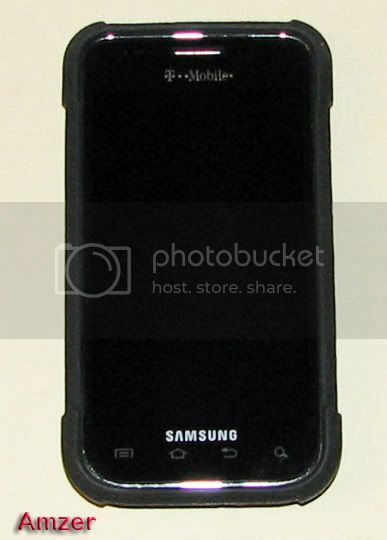 Whereas the Tmobile case does inspire confidence that the phone is pretty much protected, it does fit snugly, and does have raised "buttons" to indicate the power and volume rockers making them easier to locate. You said it all with "cheap case." It is cheap and feels cheap, while may be slightly better than no protection IMO it isn't much better if at all. Especially if the phone falls out of the darned case. Heck before I got my case I dropped the Vibrant and it was OK does that mean I shouldn't get a case that will offer reasonable protection? Here's a good analogy: I once went shopping for a motorcycle helmet, I told the guy I wanted a reasonably priced helmet. At that time helmets were priced from $25 to $200. I was thinking in the back of my mind about spending $50 or so. The guy looked me straight in the eye and said "$5 head/$5 helmet" I left with a $175 helmet. Do you really want to wrap your valuable Vibrant in a "cheap" case? Thanks again robo21, very helpful images. I'm gonna see if I can drop by a tmobile store this week and purchase the case. I like the naked look of the vibrant, but it's a little slippery sometimes and I think that case would provide a decent grip. They really need to make some girl jeans with larger pockets with the size of smartphones these days! I'll be trying to find a T-Mobile case for mine today. I was going to get the Amzer until I read this thread. It's just a shame that the T-Mobile cases don't come in more colours... I love the bright green! I just picked up the teal colored gel case from T-mobile and it really is nice. It's a lot less sticky than the gel case I had with my other phone so it doesn't get stuck in my pocket as much. I'm not a teal type of person, so I guess I'll check again when I happen by a Tmo store. It's worth the wait. Is there another Tmo store in the area? I won my ebay case against Amzer ceo! He never ended up shipping my case, and he was a complete jerk. Ditto as to everything said by robo21, SamsungVibrant, and jj718. I purchased the T-Mobile gel case while waiting for the Amzer case to arrive, thinking that I would replace the T-Mobile case with the Amzer. NOT! I also ordered a dual USB car charger with the gel case on 7/25. I was invoiced for both products, with a note that the car charger would ship on the date indicated. However, there was no date indicated. I emailed customer service on the same date that they invoiced me (8/4), requesting an estimated ship date for the back-ordered car charger. No response as of today, 8/24. So, I attempted to call their customer service number twice this afternoon. Both times the answering message repeatedly stated that I would be transferred to a rep shortly. Then, after about five minutes, another message stated that they could not "take my call at this time" and I was disconnected. It is always a red flag when one cannot reach a vendor in a timely manner. Given these experiences, I CANNOT RECOMMEND AMZER. Note that they also use the DBAs "Moftware" and "Cosmosatellite." I attempted to call their customer service number twice this afternoon. Both times the answering message repeatedly stated that I would be transferred to a rep shortly. Then, after about five minutes, another message stated that they could not "take my call at this time" and I was disconnected. OMG, I called Amzer several times too, not once did I get through. That customer service number is BS. This 866 number is the same number you see on Amzer.com. Same number that nobody ever picks up, and you go in endless loops. Another interesting thing, this is just my theory. I am very skeptical whenever an ebay seller uses a weird account name, such as numbers. Pinakin Dinesh's ebay account name is "03251975." I bet he makes bogus ebay accounts with ambiguous accont names such as 03251975, then after a few weeks of ripping people off, I bet he closes that account and opens a new one just to repeat his horrible service. I wouldn't be surprised if Amzer Ceo Pinakin Dinesh had other bogus ebay accounts. At least I won my case against him, I get an ebay refund within 48 hrs. This was deffinately my worst experience on ebay, makes me worried to purchase there again. I also have to add, finding an actual number to contact ebay took me 2 weeks. They have no number on their website! Then it took 45 mins on hold. At least Amazon, you get phone support within minutes! ps...if you are wondering what Pinakin Dinesh looks like, here is the picture of the rip off man himself. I can&#8217;t speak to anyone specific at company, but I do want to say that I'm very happy with the Amzer Gel Skin. I think it's fits fine. A bit loose around down the long sides, but not at the corners. I never feel like it's close to slipping off. I&#8217;m most pleased with the extra protection around the corners too. It makes this case very shock resistant. They&#8217;re big enough to protect the whole length of the side without the added rubber there. Every once and a while I take it off to wipe out anything that slipped behind it; but the outside has been great about not collecting dust or dirt. It makes the phone so much easier to grip as well. I got mine for $10 off Amazon and I&#8217;m not going to be swapping it out any time soon. Well Good LUCK, I hope when you drop your phone you drop it on one of those rugged looking corners! If not, you may be in for a world of hurt; everywhere else on the phone that case lacks substance. I guess it just depends on your frame of reference. I had already purchased the Tmobile gel case to protect the phone while I searched for something better. Needless to say I never found anything better and I was already spoiled by the quality of the Tmobile case. Going from the Tmobile gel case to the Amzer was night and day and you couldn't give me an an Amzer case for free. When mine came from Amazon, I laughed at the inferior quality of the Amzer. My wife said, "What the hell is this?" She was stunned by the poor fit and low quality. To each his own. If you like, please enjoy. I want my $500+ phone well protected and I don't get that feeling with the Amzer. For example, if you drop the phone face down the bezel is not protected with the Amzer, it IS fully protected with the Tmo case. This is obvious in the photos posted above. Amzer gel skin is crap. I just got mine in after waiting for a month(they said back order) and I only ordered it because my tmo case got chewed up by my dog and tmo was out of stock. This amser case is stiff as hell where the unlock and volume buttons are. I had to cut out the hole where the mic was because it was covered and nobody could hear me. It feels like if I dropped it the case wouldn't absorb any of the shock. I would say its the equivalent of using a sack of rice as an air bag as far protection is concerned. All in all I would never recommended this case to anybody and anyone who says these cases are quality works for amzer. LOL - Tell us how you really feel JREE... Good points about the unlock and volume buttons issues. I didn't really get far enough in using the POS to worry about those issues and certainly didn't keep it on my phone long enough to discover the microphone problem. It was just complete junk... Looks like someone thought, let's get some cheap skin made and to market and turn a quick buck. Like I needed a "dealbreaker" but the mic problem just proves that the Amzer is utter crap and not well thought out. I use my speech to text search function and for email/sms too often as well as the speakerphone.